Feature Christian hymns and gospel, the Old Fashioned Revival Hour is a classic old time radio Christian evangelicalism. The show was lead by Pastor Charles E Fuller who was one of the first radio ministers. 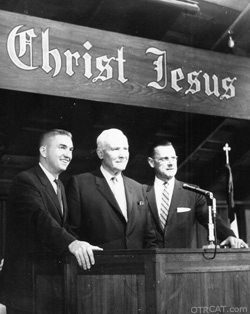 He dedicated his life to the ministry and often traveled around the country and aired live revivals. During WWII, The Old Fashion Revival Hour broadcast out of Long Beach to reach military personal about to enter the pacific theater. The Old Fashioned Revival Hour offers traditional Christian hymns with luminous voices. Be the first to comment on "Old Fashioned Revival Hour"